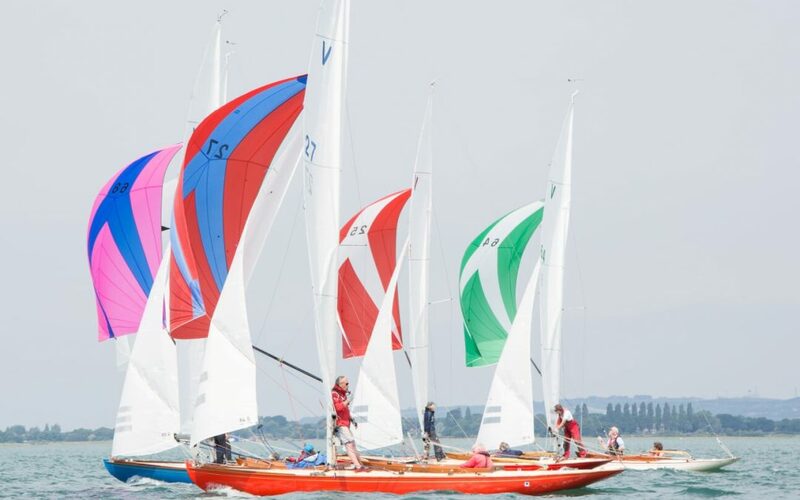 Seventeen Solent Sunbeams largely enjoyed light winds for the five-race Strutt & Parker Keelboat Points Week at Itchenor. Racing in a large fleet at high tide meant that, in the absence of the usual strong Chichester Harbour tides, good results were often dependent on competitors having good starts and sailing in clear air. The first race was sailed in winds of 8-10 knots. V25 Query, (Tim Hill) took an early lead after selecting the correct side of the first beat. Query was, however, overhauled by V41 Fleury (Joe Burnie) who recovered well after the first leg and V42 Penny (Richard Pearson). The second day started with similar light winds and V41 Fleury and V18 Polly (Nick Leach) pulled away from the rest of the fleet on the second leg and held their positions to the finish. The final leg provided plenty of tactical opportunities which allowed some boats to make spectacular gains. V43 Honey (Graham Colbourne) crossed the line in third but was disqualified for being over the line at the start. This left V61 Betty (Peter Taylor) in third place. On day 3, V41 Fleury continued to show exceptional form and Joe Burnie won his third race of the week. Behind Fleury the results were in doubt until the final few hundred metres of the race due to the available tactical choices on the run to the finish. V25 Query passed V36 Melody (Petra Tanner) for second place and only 15 seconds separated 4th to 7th places after the two-hour race, reflecting the closeness of the racing. Competitors awoke to 30-knot winds on Thursday and the race team wisely decided to postpone the final two races until the Friday, both of which were sailed in light to moderate conditions. In the fourth race V18 Polly led from the start, having managed to stay out of the adverse tide at the start. V41 Fleury and V25 Query finished in second and third place respectively. The final race saw V36 Melody take an early lead but she was overhauled by V25 Query. V11 Harmony (Duncan O’Kelly) was third. The closeness of the racing was reflected in the final results where only 8 points separated third and seventh places. As a result of his three first places, Joe Burnie won the week with a race to spare.